Hop around the Balkans for even a short time and you get to make friends with a lot of new grapes. While those in the know have possibly heard of Plavac Mali or that Zinfandel is originally from Croatia (which it’s called Crljenak or Tribidrag) few have heard of the grape, Lasina. If you have, bravo! You get a free copy of my Dalmatia wine guide. Lasin is very much a native grape of Dalmatia but the relation to other grapes in the region has as of yet been undetermined. But as is typical, it has other names too including: Krapljenica (which sounds patently horrible in English), Kutlarica, Lasin, Lasina Crna, & Vlasina. It’s probably good that Lasina became the favored name. Even though it’s a rather rare grape, it’s reasonably easy to cultivate and doesn’t have problems with fungal diseases, so that’s fun. It is however used mostly in blends which is surprising given that the varietal wines made from it are quite delicious. Many are even calling it the “Pinot Noir of Dalmatia”. Obviously that’s a lofty comparison given that Dalmatia is no place to grow Pinot Noir but somehow this grapes arrives lighter in color and alcohol than most of its comrades. That could be why it’s found more in blends as the Dalmatia palate has historically favored more potent wines. The international wine trade had a hand in that too but, much like Spain, if people were to spend more on a wine, the belief was that they should taste the hard earned dinars they were plunking down and thus, bigger was better. There are some brave pioneers on the single varietal front which I had the chance to taste at the Dalmacija Wine Expo 2015. Both are from Skradin which is in the northern end of Dalmatia. Both are neighbors and as such are a good deal inland from the sea which is probably why they find such wonderful balance from the wines. Unfortunately one of the producers, Sladić only had what seemed to be a tank sample. It was a damned fine wine though but I couldn’t bring back a sample to spend more time with it as wine fairs are a foul place to write proper notes and so the notes below are far more sparse than they should be. The other producer, Alen Bibich (who has been mentioned here a lot for good reason) hosted us with lunch at his winery where I bought two bottles of this quite excellent wine to take back home. 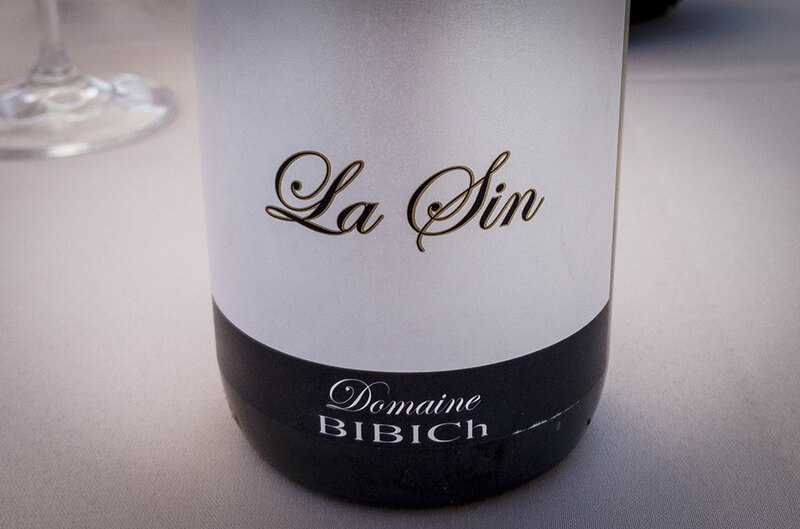 In typically Balkan humor he opts for the name Lasin instead of Lasina and calls it, “La Sin”, which is up to you as to how you interpret this mashup of English with a Spanish article. Ultimately, I would agree that the buzz is well-deserved. While the other Dalmatian grapes make fine wines, especially when modern winemaking is applied, this particular grape is quite elegant and as winemakers come to terms with what it has to offer, we’re likely to hear more about it in the years to come. Black pepper and red fruits, similar to zesty Zinfandel qualities but more smoky, chalkiness, dried herbs and oak leaves, smallest touch of licorice. Very complex aromatically. In the mouth the red fruits are prominent as well as mild toasted notes. The acidity is medium but quite on par with the alcohol and leading in to a medium short finish. Light herbal notes that expand and envelope the senses as the wine opens. Great, crisp red fruit that leads in to a full and expressive mouth feel with ethereal acidity that lingers forever in the finish.